Before Jane broke her arm we had planned to celebrate her sixth birthday at Area 51, a trampoline place. We've gone several times and she loves it. Shawn likes it too. We had to rearrange the party at the last minute, and thankfully Area 51 gave us a refund, but I worked out a "hack" for using their RSVP system. It's a little weird how it's set up. You can have electronic invitations, but they are really weird looking, and it requires you have an email address for everyone. It gives you the option to print them, but when you do that you can't use the online RSVP system, which automatically gives a link to download the required waiver. I looked for the link, thinking it was the same for everyone, but it turns out the system creates an individual link for each person who's invited. I didn't have email addresses for all of Jane's classmates, so we had to print out invites. The Area 51 print system made them look quite janky, so we skipped that. After a bit of thought I decided to print my own invites and use Bit.ly to shorten the individual links. Each girl had their own RSVP link (bit.ly/Janebday#). It actually worked! Except most parents didn't RSVP at all. One girl showed up without RSVP'ing and 5 out of 11 didn't show up and didn't RSVP. Not bad. Of course we had to re-do the party at the last minute and re-send the invitations. I ended up emailing the entire class, since I couldn't get the girls' moms email addresses separated. 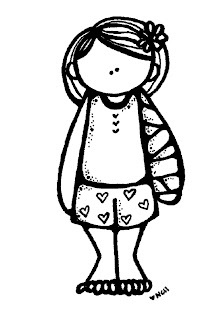 I found a really cute free clip art of a girl with a broken arm and sent change-of-plan invites to the girls again in their folders at school. Alls well that ends well, and it was a great party. I don't know if we'll ever do a party at Area 51. I'm too nervous about broken bones to think about anything like that again right now. Just want to wrap my girls in bubble wrap and keep them home in my lap!